1. Who would be most interested in an article like this? 2. What is a good cleaning solution for paintbrushes? 3. 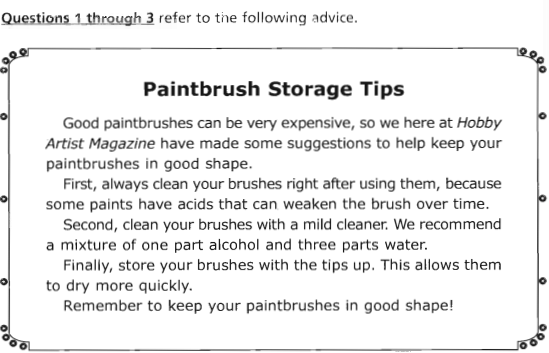 According to the text, how are paintbrushes best stored? 4. How many store branches does The Art Shoppe have? D. The article does not say. 5. 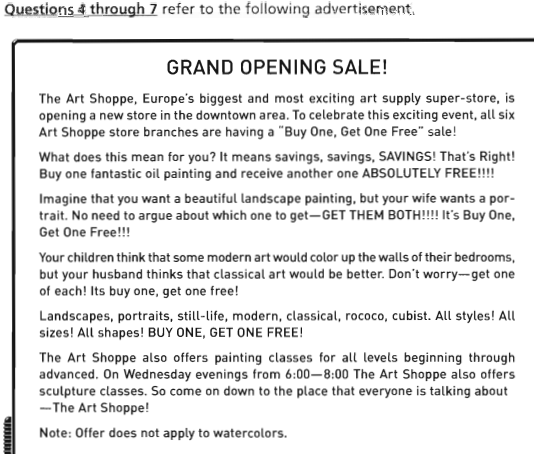 According to the advertisement, what do you get if you buy a painting at The Art Shoppe? 6. What does the offer NOT apply to? 7. What classes are offered on Wednesday evenings? 8. 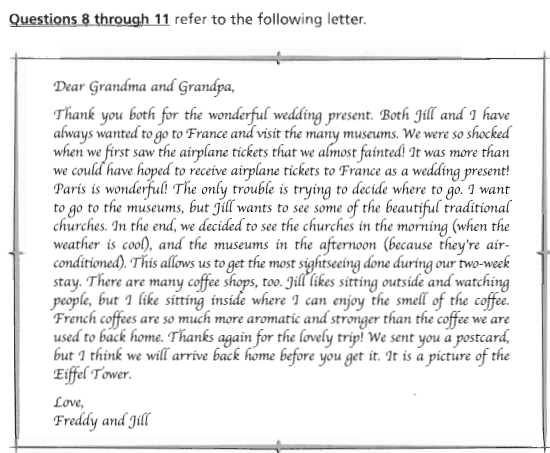 What did Freddy’s grandparents give him and Jill for a wedding present? 9. Based on this letter, which of the following could be inferred? A. Freddy is an indoor person, and Jill is an outdoor person. B. Freddy is an outdoor person, and Jill is an indoor person. C. Both Freddy and Jill are indoor people. D. Freddy and Jill hate to travel. 10. Why did they decide to visit the museums in the afternoon? A. They could get a discounted price in the afternoon. B. The museums are closed in the mornings. C. The weather is hot and the museums have air conditioning. D. The art is better in the afternoon. 11. How long was their trip? D. The reading does not say. 12. What was the age range of the students interviewed? 13. According to one art director, what do students associate art with? 14. According to the chart, what is the least likely to be considered art? 15. 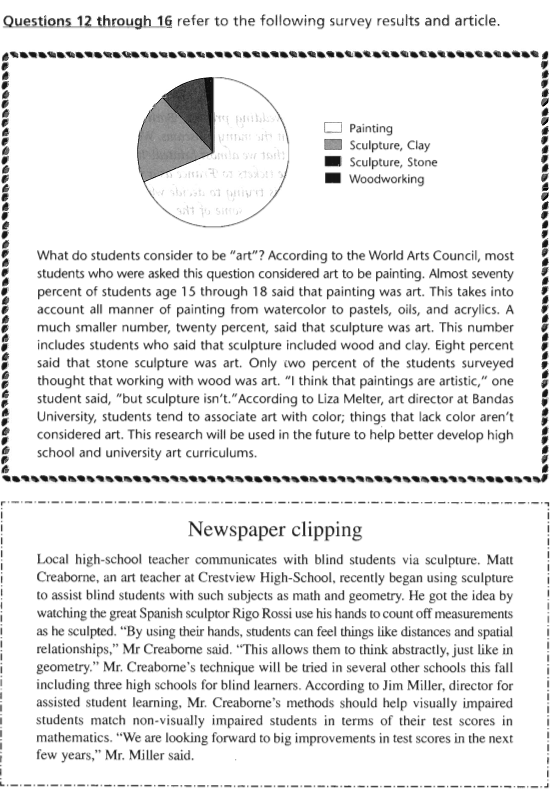 According to the newspaper clipping, which students are Mr. Creaborne’s classes for? 16. According to the newspaper clipping, what benefit will Mr. Creaborne’s technique have on the students? A. Test scores will go up. B. Test scores will go down. C. Test scores will stay the same.